It's a new year & I'm sure that I am no different than many other people who make resolutions. This year I'm trying to stick to at least one and that is to use some of the things I have just hangin' around. I'm always afraid to part with something if I only have one of it, even if I have two it's hard...just in case I can't get it ever again...well this year it's going to be a new me. You are probably wondering why is she going on like this...well let me tell you. The twill that I have used on this card was one of my very first ribbon purchases over 8 years ago...I wouldn't use it because #1 where in the world was I ever going to find twill with footprints again & #2 I only had 3 yards so I therefore could not possibly part with even 1" of it. Well that was the old me...this is the new me using my twill. I coloured my Grillafella with Copics...oh at least 2 months ago...but I was waiting for the right idea to strike before I put him together. The Faux Panel Technique works beautifully for this card...or at least I think it does. I have added some Old Paper Distress Ink to the edging as well. The twill is tied between to extra large eyelets from Stampin' Up!. 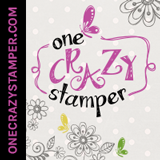 The patterned paper is Nouveau Chic also from Stampin' Up! The cardstock is SU Baja Breeze along with Sage Shadow. Hope I didn't bore you too much with my story...have a wonderful day!